CPP-LA, Los Angeles source for the Latest Craze in Party Entertainment. Virtual Reality Gaming Party set-ups feature (2-4) state-of-the-art VR headsets, (2-4) remote VR handsets, and (2) 55″ TV monitors. Party guests get to witness | enjoy all the Virtual Reality Gaming Party excitement. 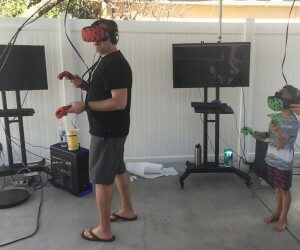 Incorporate Virtual Reality Gaming into you next party or event. Whether you’re throwing a big birthday bash or any special occasion, your guests will be talking about it for years to come. This is truly a Specialized Party Service. Please contact our booking line for additional information and pricing.